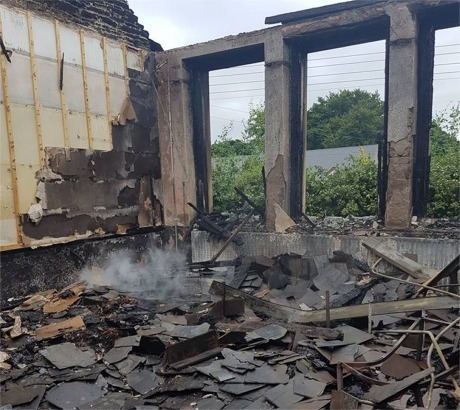 AN old national school in Moville has been destroyed by fire after a blaze broke out in the early hours of this morning. 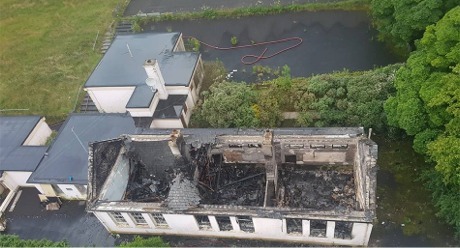 Moville firefighters were called to the fire at the disused Old Boys' School at Ballynally on the outskirts of the seaside town at 4am. They were supported by colleagues from Carndonagh Fire Station and a hydraulic platform from Letterkenny Fire Station. Donegal chief fire officer Joseph McTaggart said the fire caused substantial damage to the building including the collapse of the roof. However, he said firefighters managed to save some parts of the structure including the school's general purpose room and toilet block. It is understood that the building was being considered as a possible new home for Moville Gael Scoil. Meanwhile, the local firefighters posted details and dramatic photos of the operation on social media today. "Sad ending for the old boys school in Moville today. We where alerted at 4am this morning to deal with flames through the roof. "We were backed up by our neighbouring station Carndonagh and a platform from HQ," they told Facebook followers. At the same time, firefighters in Co Cork were battling to control a huge blaze - also at a boys' school. The fire broke out about 3am at the Patrician Academy secondary school in Mallow. Five units of the fire brigade battled for several hours to get the blaze under control but the building was substantially damaged. Some residents living nearby were evacuated for their own safety.